We recently asked our Facebook followers whether they would prefer to purchase a home north or south of the bridge and we were overwhelmed by the response. I spend my career helping people buy homes north of the bridge (that’s what people ask for) so I was really really impressed with the passionate response we received in favor of the south. I’ve always had a sense that the southern neighborhoods are somehow more stable – they’ve been around longer, I think the turnover of homes is less frequent etc. and while most of my (typically younger) buyer clients own home north of the bridge, some of our happiest ones live on the south side. In January, I wrote about a phenomenon that seems to be playing out; that is, because of the rebuild, much of the housing supply this year is being listed for sale in Abasand, Waterways and Beacon Hill, while as usual, demand favors northern properties. As the price differential between the two grows, I think the savvy buyer, would do well to consider all options before narrowing down their search criteria. 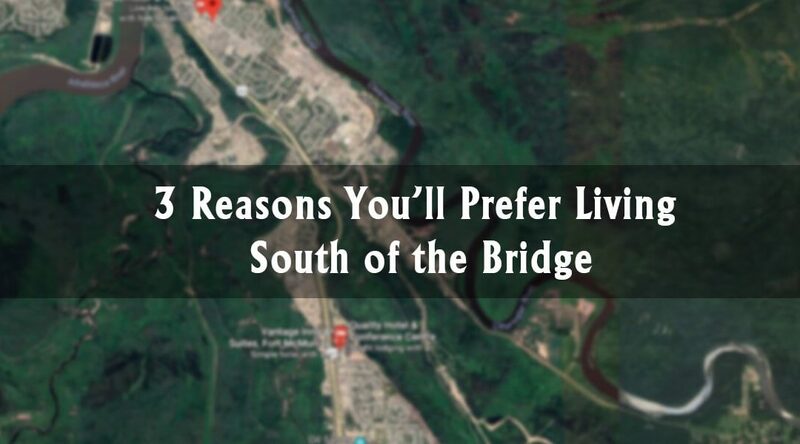 Let’s take a look at the most common reasons for living south of the bridge, as cited by residents of those neighborhoods that live in those areas (it seems that people from all the major southern neighborhoods responded: Saprae Creek, Waterways, Beacon Hill, Abasand). While we didn’t get respondents in favor of Gregoire, Prairie Creek or Grayling Terrace, we know from our interactions, how passionate residents are about those areas. Most of the road systems and housing we see today in these areas, were first built in the 1960’s and 1970’s. The typical lots are 6,600 sqft or 6,000sqft, and it’s common to find homes with lots over 7,000sqft (typically downtown or in Beacon Hill). Not only are these lots much larger than your average Eagle Ridge (say) lot, but they can be laid out incredibly well. For example, as noted by one local Facebook user, much of Beacon Hill is divided up by utility rights of way which are essentially green spaces that connect the community by foot in addition to the road system. I always get a lot of pleasure driving around these areas (especially downtown), finding hidden gems. Here are some examples of amazing streets, crescents and closes which I love, as a buyer’s agent: Birch Road (trees on one side), Peden Crescent (park in the middle), Clark Crescent (treed park in the middle), Hill Drive (some ½ acre lots backing onto a ravine/trees). Not into old housing? We have a rebuild for that!. In many ways, purchasing a rebuild south of the bridge offers the buyer the best of both worlds – the holy grail, perhaps. A nice, new home, on a large lot. This is in fact not just the holy grail in Fort McMurray, but the holy grail of the Canadian real estate market in 2018. I think it’s a real opportunity. It turns out that people still really value what downtown has to offer. Whether it’s shopping, or restaurants, or the river or Sitskaw Park (the dog park in Waterways), there is tons to do in and around the downtown area. And there are new businesses opening up all the time. In my career, I’ve got used to people crossing out downtown on my handy little map, and that’s okay, but what I learned from the response to the Facebook post, is that for all the negative talk you hear about downtown, many people who responded want to at least live nearby. Through this exercise, we also re-learned a few things that we already knew. For example, proximity to work is very important to people. Next to “newer housing”, in my experience, proximity to plant sites (where family members typically work) seems to be the main reason people who choose north of the bridge, do so. The other factor that matters is proximity to friends, family members, and your wider circle of community. If you have tons of friends north of the bridge, that’s likely where you will end up. This is connected with demographics of the different neighborhoods (age, I think, being an important factor).